Hey, museum lovers! I have great news!! The American Museum of Natural History in New York has debuted a new IMAX documentary called Amazon Adventure and I have a few tickets to give away to one of my readers! Super fun! The movie officially opens on March 9th and will run through mid-September. We always love to visit the AMNH because it is a full day adventure. The children race from dinosaurs to killer whales. There’s no telling what is waiting for you behind every corner! The IMAX movies are always a special treat, too. Bill loves to stay on top of the release schedule to see what’s coming up each season. Exploration leads to curiosity which leads to learning… and what more do we want for our children? 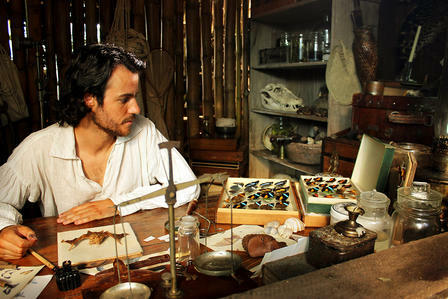 Amazon Adventure traces the extraordinary journey of 19th-century naturalist and explorer Henry Walter Bates—the most influential scientist you’ve never heard of—who provided “the beautiful proof” to Charles Darwin for his revolutionary theory of evolution by natural selection, the scientific explanation for the development of life on Earth. As a young man, Bates risked his life for science during his 11-year expedition into the Amazon rainforest. The film is a compelling detective story of peril, perseverance, and, ultimately, success, drawing audiences into his fascinating study of animal mimicry, the phenomenon in which one animal adopts the look of another. To enter, please use the form below. Winner will be chosen in one week. I’d take my kids and husband. Sounds like a fun family day! I’d take my sister since we live in two different states. And it be a nice bonding time. since we didn’t get to grow up together. I would take my son and my daughter with me if I won. I would take my husband to see this movie with me. I would take my niece and nephew with me. I am taking my husband to see this movie. I would take my daughter with me.